The wait is over – ‘Hazy Sundays’ is back! You may have watched Kaiju movies like Godzilla and King Kong. Now, for a change of palette, how about a North Korean Kaiju movie? 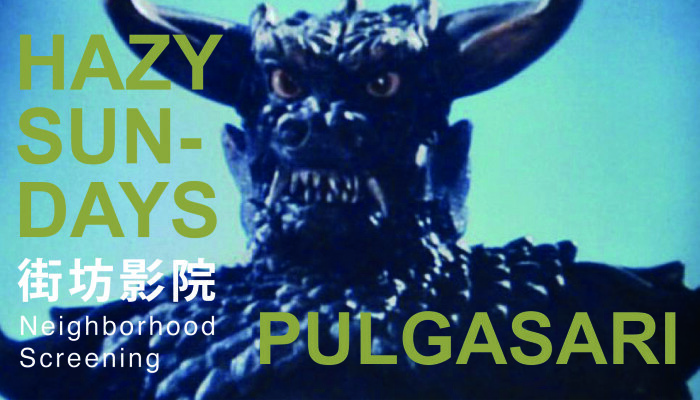 Selected by Angela Su and François Tesnière, Pulgasari (불가사리) (1985) is a cult classic perhaps best known for its historic background – its director Shin Sang-ok being kidnapped by Kim Jong-il, who was Shin’s lifelong admirer and fan of Godzilla and Kaiju films, to create a Godzilla-inspired movie set to rock the pants of Westerner and demonstrate the soft powers of North Korea. Loosely based on the Korean mythic creature – Bulgasari, this movie is, perhaps not without irony, about a giant pro-peasantry metal-eating monster that stood by the side of the peasant army to overthrow the corrupt monarchy of the feudal Goryeo Dynasty in Korea. “Hazy Sundays” is a monthly screening programme curated by Chantal Wong, Nuria Krämer and friends. Through presenting a range of handpicked films by cultural figures in Hong Kong,”Hazy Sundays” seeks to show the various perspectives on identity construction in relation to history and the changing economic and politic situations in urban cities like Hong Kong. “Hazy Sundays” looks at the junction of artistic creation and cinema, media politics, identity and site in an approachable way, inviting members of the public and movie aficionados to engage in social dialogues, re-examining the relationships between the self and the culture. All screening sessions are open to public and free of charge.